However, every duration estimate, cost estimate, risk impact and other estimate our project plans are based on an ‘average’ or ‘expected value’ derived from past experience. And as naturalist Stephen Jay Gould commented, our culture encodes a strong bias either to neglect or ignore variation. We tend to focus instead on measures of central tendency, and as a result we make some terrible mistakes, often with considerable practical import. The flaw of averages ensures plans based on a single average value that describes an uncertainty will be behind schedule and over budget! A typical example from the book looks at a stocking problem – the business is planning to import short shelf life exotic fruits with a high profit margin, the marketing team have analysed the market and developed a profile of likely sales. The boss looks at the distribution and demands a single figure. All the marketing team can do is take the ‘average’ expected sales and decide 500 cases per month are the most likely level of sales. Based on a profit of $100 per case the boss predicts a net profit of $50,000 per month. However, this is a very optimistic estimate, if less than 500 cases are sold, the fruits will spoil with losses of $50 per case, if more than 500 cases are required the cost of airfreighting extra cases is $150 per case resulting in a loss of $50 or the sales have to be foregone with a risk of losing the customer. The highest possible monthly profit is $50,000 – if more or less are sold the profit reduces. On average each month more or less than 500 cases will be sold, resulting in returns lower than the estimated $50,000. The only time the predicted profit will be realised in the occasional month when exactly 500 cases are sold. Even if the company decides not to airfreight additional cases on average the monthly profit will be less than $50,000. Without airfreight, for roughly half the time demand will exceed 500 cases but with no additional stock, profit is capped at $50,000. For the other months, sales will be less than 500 and there will be spoilage costs. Meaning on average, the monthly profit will be less than predicted! The average is correct, the way the manger is using the average is the ‘flaw’. 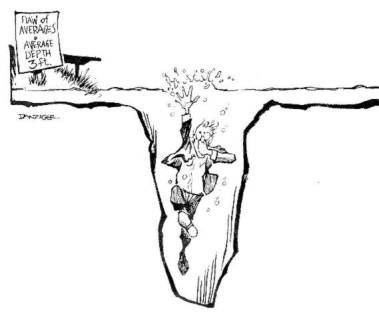 The same problem shown in the cartoon above, ‘on average’ the pond is only 1 meter (3ft) deep! But averages are rarely what is needed for prudent management. To properly analyse the projected profits more in-depth analysis is needed, using techniques such as Monte Carlo analysis with the variability of sales being represented by the input probability distribution, the costs and income expected modelled in the tool and the resulting profits predicted in the output probability distribution. The challenge is getting valid data to model. Projects are by definition ‘unique endeavours’ which means there is no pool of directly valid data; this problem is discussed in our paper The Meaning of Risk in an Uncertain World . When managing project uncertainties our basic data is uncertain! Recognising this simple fact is a major step towards better project management. To quote George Box (Stamford University) ‘All models are wrong, some models are useful’. No model should be taken as correct, this includes schedules, cost plans, profit predictions, risk simulations and every other predictive model we use! They are never complete representations of exactly what will occur, but a successful model will tell you things you did not tell it to tell you (Jerry P. Brashear). 5. Trash stages 1 through 4 now you know what you really want. And to get a large model to work, you must start with a small model that works, not a large model that does not work. If you want to understand flight what is more useful, a large highly detailed model of a Boeing Jumbo jet built out of Lego blocks that cannot fly or a simple paper aeroplane that does? The complex Lego model may be visually impressive but is likely to be less useful in understanding a dynamic process such as flight. The same is likely to be true for most dynamic project models. Edward Tufte says ‘Clear and precise seeing becomes as one with clear and precise thinking’, and John W. Tukey adds ‘It is far better an approximate answer to the right question, which is often vague, than the exact answer to the wrong question, which can always be made precise.’ It is dumb to be too smart! These concepts are consistent with the PMBOK® Guide idea of ‘progressive elaboration’ and are embedded in the scheduling technique called ‘Schedule Density’ where the initial schedule is developed at ‘Low Density’ and additional detail added as needed (see more on Schedule Density). The message from this blog is building a useful model is a skilled art, regardless of the subject being modelled (time, cost, risk). A good start is to keep the model simple, if you don’t understand how the model works how will you will be able to judge what it shows you? The model is never the truth; at best it is a useful! And its usefulness will be severely reduced if you rely on averages such as single point estimates without at least using some probability analysis. Melding the need for precision with probabilistic assessments are discussed in our paper Why Critical Path Scheduling (CPM) is Wildly Optimistic. Whilst this post has focused on one dimension of uncertainty (time and schedule), the principles can be applied to any area of uncertainty. Yesterday, I had the pleasure of attending a joint meeting of the Association of Governance SIG and the Institute of Directors (IoD) in London. The focus of the meeting was governing projects and programs. * Closing the gap between Business and Society. Tomorrow’s company believes business can and should be a force for good; to promote this concept they have established an interactive website http://www.forceforgood.com with freely accessible resources, blogs and debate. Directors and managers interested in engaging with world-leading thinking are encouraged to visit these web-sites. The two interlinked themes in the work of the Tomorrow’s company are stewardship and governance focused on creating sustainable value. The external drivers that influence the creation of sustainable value for every organisation are the natural environment, the current social and political systems, and the global economy. Managing these drivers effectively requires organisations to rebuild trust and retain a ‘licence to operate’, which in turn requires effective stewardship of the resources within and affected by the operation of the organisation. The purpose of corporate governance is to facilitate effective, entrepreneurial and prudent management that can deliver long-term success for the company (UK Corporate Governance Code). The APM presentation built on this theme of creating sustained value and linked the concept of a ‘Board Mandate’ that clearly enunciates the values and purpose of the organisation and the Board, to the creation of a sustainable strategic plan, that is implemented through effective portfolio selection processes that select the ‘right projects and programs’ for the organisation to invest in. Once the projects and programs are selected, the overall capability of the organisation to undertake the projects efficiently and manage the organisational change aspects needed to realise value from the project deliverables takes over, and the critical importance of effective project sponsorship was highlighted. Or to be more accurate two countries. I have just finished a 5 day trip to Shanghai and have landed in the UK. First impressions of the UK is the place is slowly decaying into insignificance, visiting Shanghai after a 3 year break and the progress is very noticeable. Shanghai is a much larger city than greater London – its traffic is bad, but works. The place is clean, very little litter, major attempts to grow greenery and virtually everything looked well maintained. Watching as an outsider, the problems Shanghai faces are created by its success and growth. What was most noticeable was the work to overcome these issues and problems. Problems were defined and resources committed to developing solutions. There was a noticeable pride in the city and in China’s re-emergence as a world power. Flying from Shanghai, I arrived in the UK on a wet afternoon – the M25 was a dysfunctional parking lot. The BT internet service did not work at the family home – plenty of signal strength but despite having a paid BT account no access for 4 hours despite repeated attempts to connect! My Australian Telstra 4G modem does not work – no signal. The UK is one of the richest and most densely populated countries in Europe and basic services readily available in most developing countries are dysfunctional. More worryingly the press and political system seem to accept second rate as normal. The genuine patriotic reverence for the Queen’s Jubilee celebrations showcased the ‘best of British’ – however, what commentators eulogising over putting the Great back into ‘Great Britain’ forgot was that when Britain was ‘great’ it had world-leading capabilities and these were founded on world-leading communication infrastructure such as canals and railways. The key infrastructure of the 21st Century is broadband communication – Australia is building its national broad band network (although some luddites think this is unnecessary), China is investing heavily to keep up with demand (as is Singapore, Malaysia and a host of other countries); so why has the UK become so uninterested in providing an equivalent service that works to help business and grow the economy? My feeling is UK business seems more interested in cutting costs than making money –corporate anorexia (you need to invest wisely in capability, service delivery and people to make money). The government is frightened to lead and the press seem more interested in any salacious scandal than pushing for effective service. Great empires take a long time to decay – strong civil systems are remarkably resilient, however, the parallels between the decay of the Roman Empire in the 3rd century and the collective European Empires in the 20th century is interesting to say the least. A loss of technical dominance as countries outside of the ‘empire’ learned to emulate the technology of the Romans, major wars between competing factions followed by the emergence of new dominant cultures that eventually destroyed the empire and usurped its power and property. The Roman system was unable to reinvigorate itself to compete effectively in the changed world of the 4th century. Will history repeat itself in the 21st century with commerce replacing legions in the ‘battle’? I hope not but the signs are worrying. Apparently anything up to 35,786Km (22,236 miles) long! NASA have offered a $2 million award to the team that can create a cable strong enough to support a space elevator rising from the equator to a ‘counter weight’ tethered in orbit more than 35,000 Km above the ground, using inertia to keep the cable taut. So the next time someone on your team asks ‘How long is a piece of string?’ you have a plausible maximum value – the current safe answer is probably less than 35,000Km (but only until some genius rises to the challenge set by NASA). We are participating in the Project Management for Major Projects Symposium, in Sydney from 30th July to 1st August 2012. My workshop on the morning of 1st August is focused on How to use project scheduling to drive project success. In this intensive workshop focuses on the key elements involved in effectively managing the use of time on major projects. Understanding how your scheduling tools work is only half the battle – this workshop will show you how to use your tools to proactively manage time to achieve success! A suggested framework for successfully managing time on your projects. If you decide to attend, we may even be able to arrange a small discount for you – drop me an email and I will see what can be done.